Blurb: "This is the true and humorous story of one woman's conversion from plant ignoramus to moderately competent gardener. Set in the place considered by some to be the very center of the gardening universe - Portland, Oregon, aka the City of Roses - the author explains how she came to attend nature's own school of hard knocks. 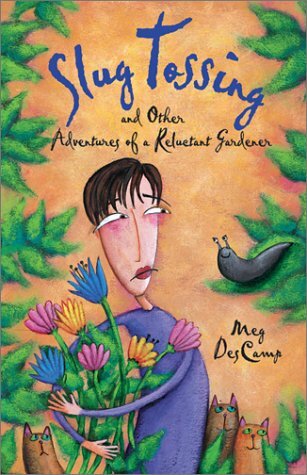 Meg DesCamp is the original second-class sitizen at the nursery, too flabbergasted to utter her rudimentary questions, able only to wonder in silence why anyone would want to put limes in their dirt. Who else but an uninitiated novice would insist on seeding a new lawn rather than calling the turf guy? This gardener's confession will elicit sympathy and laughter from anyone who has recently taken up the trowel and made the near-religious conversion to amended soil." Humorous, but it's sad the writer depicts herself as someone who always fights with her husband and is extremely competitive towards her sisters. It doesn't make her lovable. Also I'd like to get to know the neighbours better, we only glimpse them every now and then, so that the death of neighour Ed is quite a surprise. But the writing about gardening is funny and informative. With a bit better editing, this could have been a great book! The (cover) illustrations by Susannah Bettag are attractive and are one of the main reasons I bought this book. Indeed, the illustrations on the cover was enough to want to grab this book and take it home, loveable heroine or not. Of course, the title alone is enough to entice me. I am not afraid of some slug tossing myself. Indeed, not the most loveable person. At least from the point of view of slugs. It wasn't such a thrilling story as I expected. Mostly about fertiliser. This book travels to the UK, in a double swap. I hope you enjoy it, coolboxuk! Received today - should be fun to read! Thanks a lot!! !